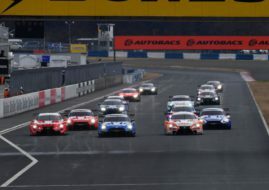 The Fuji GT 500km race, the second round of the 2018 Japanese Super GT Series, took place at Fuji Speedway. The winners in the GT500 class are Tsugio Matsuda and Ronnie Quintarelli in the #23 Motul Autech Nissan GT-R. In the GT300 class, Shinichi Takagi and Sean Walkinshaw won the race from pole position in the #55 ARTA BMW M6 GT3. With these victories, both Tsugio Matsuda and Shinichi Takagi extended their own records for most wins in the GT500 and GT300 classes respectively. It’s the 20th win in GT500 class for Matsuda and 19th win in GT300 class for Takagi. Yuji Tachikawa started the 110-lap from pole position in the #38 Zent Cerumo Lexus LC500, which he is sharing with Hiroaki Ishiura. During the opening lap, Ronnie Quintarelli took the lead and the #23 Nissan stayed in front until the end of the race. Quintarelli managed to defend the lead ahead of group of Lexus drivers but after he handed the car to Tsugio Matsuda, they dropped to P2. Heikki Kovalainen took the lead and gave the #39 Denso Kobelco SARD Lexus to his teammate Sho Tsuboi. The situation converted after the second round of pit stops, when Quintarelli retook the #23 car as the leader, in front of Kovalainen in the #39 car. The third place went to the pole-starting #38 Lexus of Yuji Tachikawa and Hiroaki Ishiura. In the GT300 class race, the pole-sitting #55 ARTA BMW M6 GT3 was in the lead from lights to flag. Shinichi Takagi started the race and handed a car to Sean Walkinshaw on lap 37. After the first round of pit stops, the #61 R&D Sport Subaru BRZ of Hideki Yamauchi was in the second place, ahead of the #31 apr Toyota Prius of Koki Saga. On lap 55, the #61 Subaru stopped. The #31 Toyota crew inherited P2 and stayed there until the end. Koki Saga shared a podium with his teammate Kohei Hirate. After the second round of pit stops, the #0 Goodsmile Hatsune Miku Mercedes-AMG was in the third place, ahead of the #11 Gainer Tanax Nissan GT-R. Gainer’s Katsuyuki Hiranaka managed to pass Mercedes and earned the last place on the podium, together with his teammate Hironobu Yasuda.